So it has been just over a year since I decided to take the plunge and go bleach blonde. And although I do enjoy getting called Khaleesi, (which due to being called that so much I decided to start watching Game of Thrones; she is a total badass and makes me wish I could be the Mother of Dragons) I wanted to mix things up, yet again. I have been timid to try out the grey for awhile now, but finally just thought to myself, why not? Just do it, and if you don't like it, just re-bleach it! Well, I am happy to say that I am very pleased with the results! Throughout my time bleaching my hair, and now dying it, people quite often ask me how my hair still looks and feels so healthy even though I am putting terrible chemicals in it. So today I thought I would share a few of my tips and tricks as well as some very educational information from my hair stylist / colorist on how to keep your hair healthy. To start with, going grey actually has not and will not damage my hair. What damages my hair is the bleach, and unfortunately, there is no way to go grey without first bleaching it. So since I am pretty much killing my hair, there are a few things I do to try and make sure I don't go bald. Sulfate free shampoos and conditioners are what you want! Sulfate is the chemical that is known to make shampoos "sud" and it actually strips away the color in your hair. Sulfate free shampoos won't sud, and I know for me, in order to feel like i'm really cleaning my hair, I prefer the suds. Products that contain cranberry oil would be the way to go. Cranberry oil will cancel out the sulfate in the shampoo, but will still give you that sudsy feel. Okay lets break this down to the basics for a second; shampoo opens up the air shafts in your hair and cleans out all the grease and yuck, the conditioner then goes on and closes those air shafts back up to protect your hair. 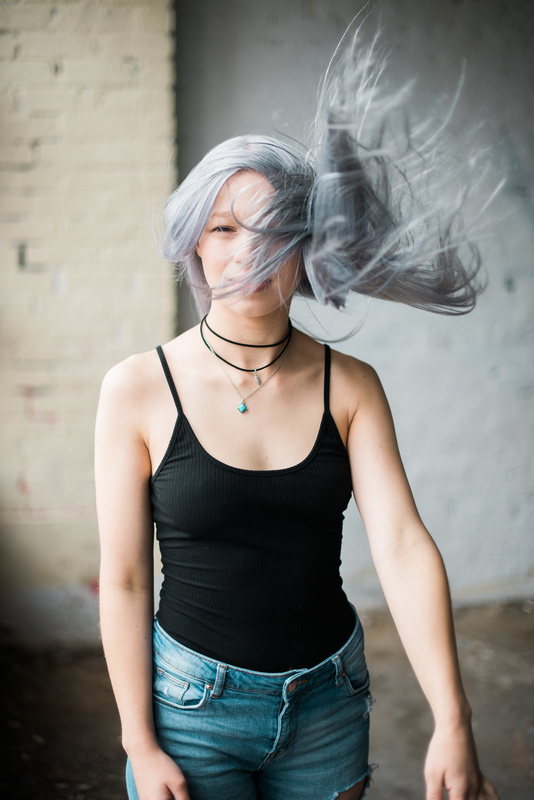 Normal shampoos that contain sulfate strips those air shafts of not only the gunk, but the color too, so by using sulfate free hair products it can help the color in your hair last longer. Although professional products are always the best choice, some sulfate free, over the counter options would include Mark Anthony and Nexus shampoos and conditioners. So stock up on those nourishing oils, heat protectants, aloe or naturally based products and start lovin on your hair, the extra effort and money is worth it! Thank you to my lovely step sister / hair stylist Julia, for the great information and for doing such an awesome job on my hair!